Anyway, this is a follow-up to my previous post last month about this same site. On 07 FEB I made another visit to these ongoing excavations inside Jaffa Gate related to a long-term infrastructure project. I did not have my camera along, however trying to snap photos probably would have gained me an invitation to leave anyway. As it was, by acting like I “belonged” there I was able to walk under the plastic tent now erected over the growing excavation at the head of David Street, immediately in front of the Swedish Christian Study Center. They even had a wooden cat-walk and little display board with maps and diagrams set up – whether for the archaeologists or VIP visitors, I don’t know. In any event, I found myself standing next to archaeologist Dan Bahat (with his unmistakable, massive ‘walrus’ mustache) who was explaining the site to a small group of visitors. Unfortunately, it was in Hebrew, which is ‘Greek to me’. And, two weeks ago – likewise on a Sunday morning, which seems to be ‘prime time’ – I spotted IAA director Shuka Dorfman on the site. Long story short: It would seem that some significant remains are definitely coming to light. I will simply say, from my informed layman’s perspective, that if someone wanted to go looking for the “first wall” of Jerusalem known to Josephus and described by him in the first century (War 5:142-5), which we understand to have run from the Temple Mount westward to today’s Jaffa Gate area – he or she could not choose a better spot! And, what is sometimes forgotten (and Josephus himself probably didn’t know! ): That “first wall”, in its lower parts, probably dates to the time of Hezekiah, when (I believe most experts agree) Jerusalem’s southwestern hill was first enclosed within the city walls. ABOVE: First, here’s an image from 24 JAN 2010 which I neglected to post last time: a stone-lined shaft near the gate-tower which seems to open into a subterranean space. The opening measured perhaps 1 meter in its longer dimension. I mentioned this feature to George Hintlian and he thought it was modern, which makes sense from the level (Hintlian, an Armenian, is another Jerusalem fixture and a trove of local lore). This shaft opening has now been covered up or, I suspect, converted into a modern sewer installation. The previously exposed, north-south wall segments near the gate-tower have likewise been covered over. 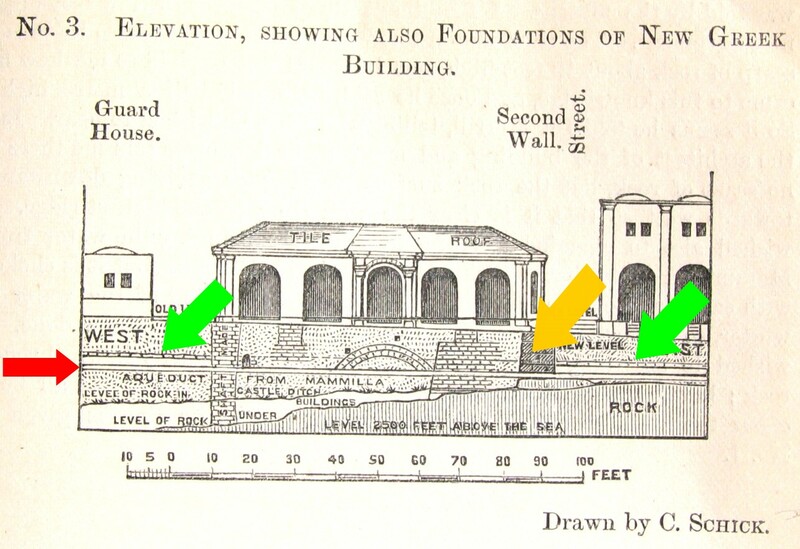 BELOW: Two sectional drawings and a plan of the area around today’s Imperial Hotel (which had only been built to one storey at the time), showing an aqueduct coming in “from Mamilla” (red arrows) and remains of what Conrad Schick took to be – and very likely is – the “second wall” of Josephus (yellow arrows); the latter is not involved in the current excavations – at least not yet. Both diagrams are by Schick and taken from the Palestine Exploration Quarterly, 1887, pp. 217-219. The large building in the center is today’s Imperial Hotel (then “Grand New” Hotel), built as a commercial property by the Greek Orthodox. North is at the top. 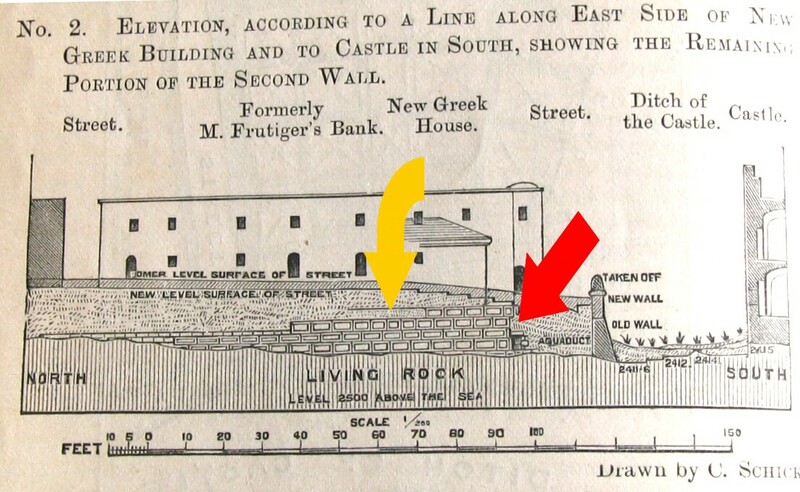 Note the aqueduct running in front (red arrow) and the “second wall” (yellow) on which the hotel’s east wall is founded. An elevation (looking north) of the facade of the Imperial Hotel building, and a section showing the substructures. Note once again the aqueduct and second wall. 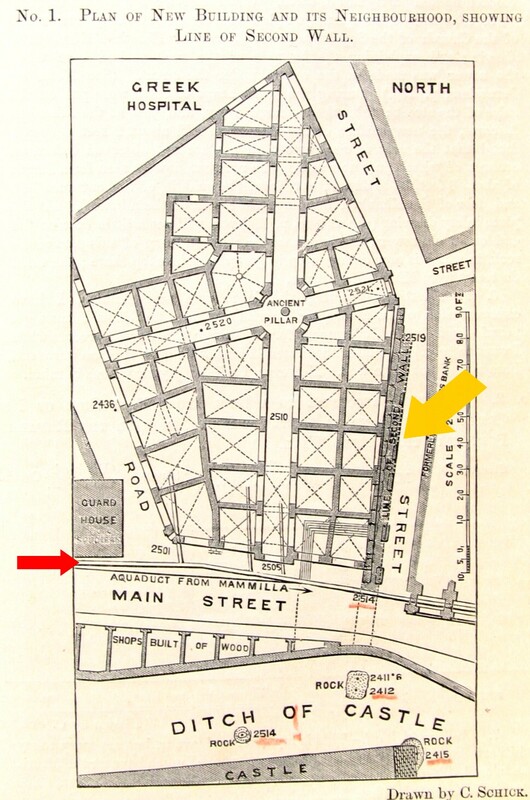 Also, shown is an ancient pavement (green arrows), on which one of the hotel’s piers is founded. The same pavement has apparently been uncovered nearby in the current work. 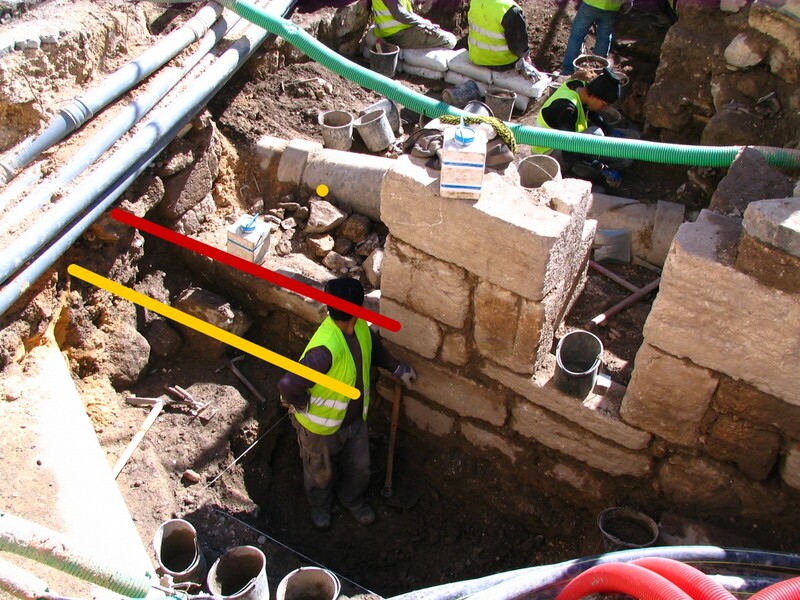 BELOW: Finally, the current state of the work at the head of David Street: The excavation has now gone down well below the level where the man is seen standing. What is particularly interesting is that this nice ashlar wall is clearly founded on an earlier wall of large, rough stones (could it be the “first wall”?). Then, perhaps 1.5 meters below the red line a nice flagstone pavement has come into view, and another .5 meter or so below that a drainage channel covered with capstones was visible. The open space to the left turns out to be quiet a wide doorway/gateway, perhaps 2.5 to 3 meters across, but its massive threshold lies approximately at the level of the yellow line; the stones above that level obviously represented a later blocking of the original opening. The trench behind this facade has also been considerably deepened, by the way. 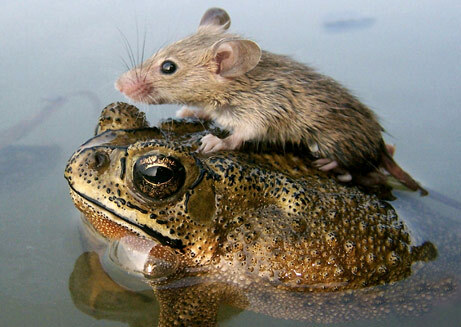 Anyway, it’s a fascinating ongoing show… Stay tuned! 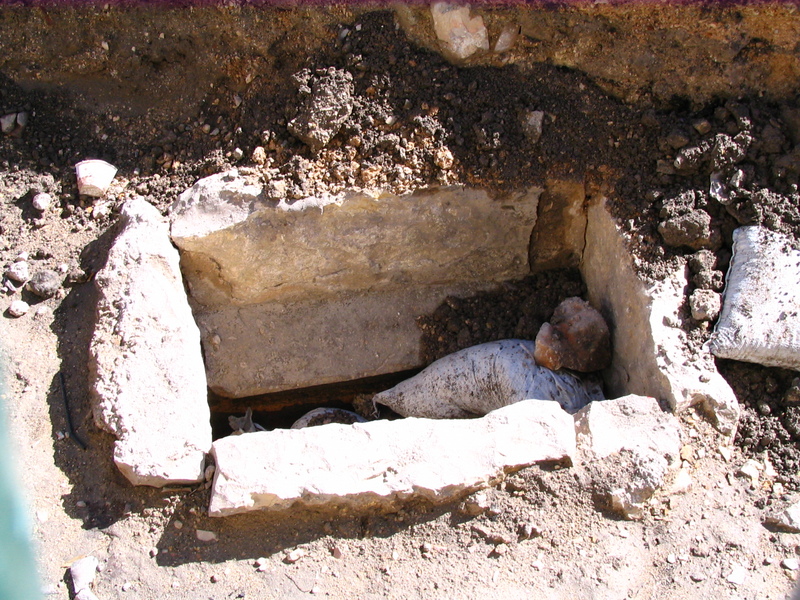 This entry was posted in Archaeology, Jaffa Gate, Jerusalem Antiquities and tagged aqueducts, Archaeology, Citadel, first wall, Jaffa Gate, Jerusalem, Old City. Bookmark the permalink.